I’ve always been a Swiffer kind of gal. I’ve got my Swiffer mop and I’ve got my Swiffer cordless vacuum. So off I go Swiffer vacuumin’ and then Swiffer moppin’ – over and over and OVER. I’ve always wondered why oh WHY couldn’t someone come up with ONE floor care tool that vacuumed AND mopped at the same time? Introducing – A Cordless Vacuum That Vacuums and Mops at the SAME TIME! I’ll tell you all about that new cordless vacuum mop gizmo here in a moment, but first, let’s talk about the absolute best-rated cordless vacuums this year overall and get you some reviews to read. Those are 3 amazing cordless vacuum cleaners right there – you can’t go wrong with any of them. It’s most likely that you’re familiar with Hoover and Eureka cordless vacuums – they are both really great, high-quality brands – and those 2 stick vacuums above are exceptional. Thing is, they aren’t just great for “my” kind of vacuuming needs, they are also excellent college dorm room vacuums and an awesome option for the elderly who need a more lightweight vacuum cleaner that is easier to handle than a full-sized unit. That said, I wouldn’t be surprised if you said you’ve never heard of the Rowenta cordless stick vacuum above. 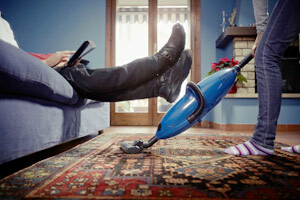 Consumers LOVE that Rowenta vacuum! They love the suction power and the long charge/battery life of that cordless. “After charging this and running this vacuum for the first time, its power was stunning for a cordless model. I have had several cordless vacuums, none with this suction and pep. This is a great vacuum. Price point reflects the quality of the product.” Read the full review here. It’s a pretty awesome little cordless vacuum, that’s for sure! If you’re looking for a cordless vacuum cleaner that will be best-rated for a long time to come, choose any of those top 3 cordless vacs above. You can’t go wrong and you will be happy with your purchase. But, if you’re willing to try something new, let me tell you about the “latest and greatest” in the cordless vacuum cleaner world. The Dyson Hard DC56 Cordless Vacuum Cleaner is engineered for hard floor cleaning. Using dual vacuum suction channels and a wet wipe, it removes both dirt and grime in a single action. It has patented Root Cyclone technology and is powered by the Dyson digital motor V2. It’s the only vacuum cleaner to combine powerful constant suction and a wet wipe. You can also easily remove the bottom part and use it as a simply cordless handheld vacuum for the stairs or your car. If the thought of an all-in-one vacuum/mop combination interests you, feel free to read all the reviews here or click the Dyson banner below to learn more, watch videos, get the full list of features, etc etc. Otherwise, you can see all top-rated and best cordless vacuum cleaners for 2016 and read their reviews right here on this page.